This programme will teach you the principles and techniques involved in environmental management. 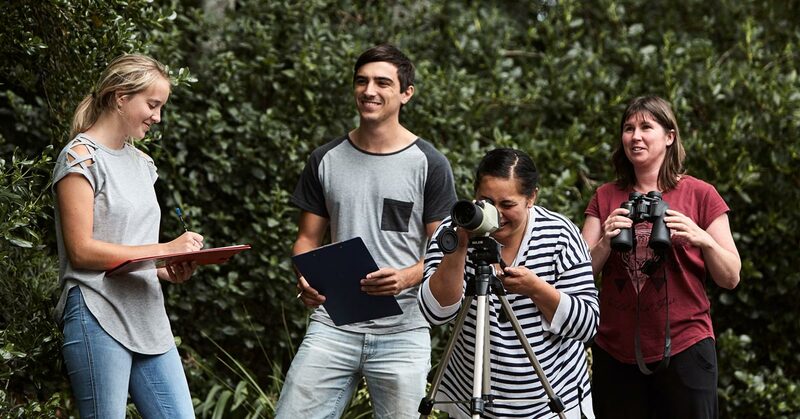 You’ll gain a practical and theoretical knowledge of terrestrial and marine ecosystems, flora and fauna in New Zealand and learn about sustainability, environmental issues, monitoring and conservation techniques. You’ll also get involved in the protection and restoration of local natural, rural and urban environments. Describe global environmental issues (with a focus on New Zealand) to determine their impacts on societies and ecosystems, and basic mitigation measures. Use data collection and surveying methods to monitor environmental ecological or asset management. Apply knowledge of New Zealand terrestrial biology and ecology systems to enable organism monitoring in a field environment. Aim: To provide students with an understanding of key global and local environmental issues and options for mitigation. Describe the causes of global and local environmental issues. Explain the impacts of environmental issues on societies and ecosystems. Describe a range of measures used to mitigate environmental issues. Aim: To enable students to examine the direct and indirect effects of human colonisation on biodiversity with an emphasis on New Zealand, and to explore available mitigation options. Trace the arrival of humans and describe their direct impacts on the environment. Identify the ecological impacts of introduced plant and animal pests in New Zealand. Describe a range of measures used to mitigate human impacts in terrestrial, freshwater and marine environments. Aim: To provide students with a practical understanding of biological monitoring methods in the terrestrial environment. Explain the role and function of monitoring. Identify and select appropriate methods to collect, summarise and report on data. Aim: To provide students with an understanding of New Zealand’s terrestrial ecology in the context of general biogeographical and ecological principles. Describe the ecology of New Zealand in the context of past biogeographical processes and events. Explain the structure and function of populations, communities and ecosystems in New Zealand. Identify and describe the principal vegetation types and their constituent species in New Zealand ecosystems. Aim: To enable students to investigate and understand the origins of biological diversity, the causes and mechanisms of micro and macro evolution, and taxonomy. Explore the origins of life. Describe the principles of evolution and their applications in biodiversity management. Describe and explain genetic processes and their applications in biodiversity management. Describe the principles of taxonomy. Aim: To promote students understanding of the diversity of plants, fungi, macroalgae, protists and prokaryotes in the context of evolutionary theory, while examining the links between structure, function and the environment. Identify and explain the distinguishing characteristics of plants, prokaryotes, protists, macroalgae and fungi including their diversity and taxonomy. Describe the ecological roles of plants, prokaryotes, protists, macroalgae and fungi. Describe and explain the evolutionary responses of plants, prokaryotes, protists, macroalgae and fungi in a diverse and changing environment. Aim: To enable students to understand basic pest management techniques and gain practical experience in their implementation. Describe a range of methods used to monitor and control introduced animal pests. Describe a range of methods used to monitor and control introduced plant pests. Demonstrate the correct use of a range of navigational techniques and technologies. Aim: To promote students understanding of the diversity of animals in the context of evolutionary theory, while examining the links between structure, function and the environment. Describe and explain the distinguishing characteristics of animals including their diversity and taxonomy. Describe the ecological roles of animals in New Zealand. Describe and explain the evolutionary responses of animals in a diverse and changing environment. On completion of this qualification, graduates may progress onto the New Zealand Diploma in Environmental Management (Level 6). Applicants for whom English is not a first language must have an IELTS Academic score of 5.5, with no band score lower than 5; or an accepted international equivalence. Applicants who do not meet the entry requirements but whose skills, education or work experience indicate that they have a reasonable chance of success, may gain admission at the discretion of the Programme Leader or designated nominee. Ben has worked in some of New Zealand’s most beautiful places with our most special animals. He began tutoring at NorthTec in 2013. I have always enjoyed being in the outdoors and learning about New Zealand’s unique environment and wildlife. My main research interests revolve around behavioural ecology, wildlife management, and ornithology. Therefore, just about everything that has legs, wings or fins is okay in my book! Ashlee Lawrence works as a Biosecurity Officer for Northland Regional Council, managing the Freshwater Pest programme for the region, as well as working on the biocontrol agent programme, in particular those that will assist with the control of wild ginger in Northland. Ashlee’s introduction to working in biosecurity came while she was still studying for her diploma. Ashlee points to some specifics from her NorthTec training that have given her confidence in her work skills. Another key study subject that Ashley says dovetails with employment is Geographic Information Systems (GIS), which was recently introduced into NorthTec environmental training. “My dream is to someday work as a Biodiversity Asset Ranger in the South Island amongst our richly diverse environments down there." The Limestone Island Ranger position is now limited to a three year contract. Bernie – “I’m a year into it and loving it. When the time is up though, I’ll probably go on to something bigger and better, like Little Barrier Island, but I’m happy to go anywhere and I know I’ll enjoy whatever comes up. Lyn chose the subject of streams on Little Barrier Island as her special negotiated study third year project for her degree. Lyn created a poster to present the information from her study and was invited to submit the poster to the Entomological Conference in Queenstown in April this year. “The posters submitted are usually from Masters students so it was an honour to be involved - and my poster received the award for second place. I looked at the special place Little Barrier Island has in NZ conservation and was also able to compare my aquatic survey with a similar study done 50 years ago." NorthTec conservation student Alex Going does a great job of juggling work, studies and parenting as she progresses towards gaining her degree. Two revised NorthTec qualifications will prove even better at meeting the region’s conservation needs, says a leading environmental management tutor.